Archives of Eaton Bray News for November 2009. This article was published in November 2009. Please see Latest News for more recent information. Lions turned in a scintillating display against St Martin's to secure a valuable point and retain second spot in the league table. Despite the goalless scoreline, there was eye-catching football at both ends. Stout defending from James Glover and mobile rear guards Joe Thorne and Sam Bramston ensured a quiet game for keeper Cameron -Burchill, who was nevertheless reliable on those rare occasions he was called upon. Intelligent passing from midfielders Joe Rabey, 011ie Ward and Myles Frederick culminated in a string of strikes at goal, and shots from Toby McGee and Sam Carter might have put a goal on the scoreboard, but ultimately the stalemate remained intact, so equally matched were the two sides. Lions found themselves well contained for the most part in a match which they could have won but for a lack of co-ordination and some frequent errors. Threatened time and again by an effective Langford strike force, the midfield were finally able to break loose as Chris McGee made a run and fired in a cross to be completed by a perfect Sean Woodhouse touch. Charlie Nevitt scored immediately afterwards, finishing his own 40-yard run with a fine strike on goal. Almost as quickly as they had reasserted themselves, the hosts once again surrendered possession and Langford hit back twice to level the match at the break. The second half saw Langford continue their dominance, testing the back line of Aarin Johnson, Jake Draper, Mason Ashby, Alex Poynter and Adam Bradley. Dan Kennel showed safe hands as a sequence of well placed corners and long range lobs came his way, but the visitors were able to land a third to go ahead. Enterprising runs from James Hurley and Will Juster, along with some neat link-ups between Aaron Gauntlett, Sean Woodhouse and Tom Horner almost resulted in the equaliser. Tireless midfield work from MoM Ben Roberts helped maintain momentum and a mis-struck Dominic Ryan kick passed just wide of a post but Lions could not grasp the opportunity to draw level before the whistle. Seperately, our sponsors who, for many years have supplied bridesmaids' dresses, have stopped that line of business. Do you have connections with anyone who could supply such outfits? To contact the Carnival Committee, see the Carnival website. A silver 15th century disc, called a vervel, has been confirmed as treasure following an inquest at Dunstable Coroner's Court. 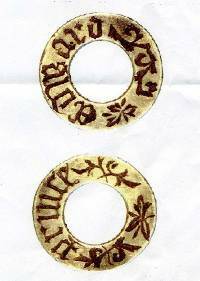 The solid circular disc, discovered in Eaton Bray, has the name Edward inscribed among foliage on one side. It was used to connect leather jesses attached to a hawk's legs to the bird's block when grounded. And according to comments from the British Museum, the inscription could relate to Edward Prince or Prince Edward, the son of Henry VI, or the son of Edward IV, who later became Edward V.
Finder Mr Wilde discovered the piece in an area belonging to landowner Mr French in 2007. But it was not until a few years later that Mr Wilde realised it could be more than 300 years old. The inquest heard how Mr Wilde took it to Birmingham City Council, which then gave it to the British Museum for inspection by specialists. As the piece is made of a minimum of 10 per cent precious metal, this means that it qualifies as treasure under the Treasure Act 1996. Coroner David Morris said that he would register the vervel as treasure with the British Museum. Spectators endured torrents of winter rain at the Rye but were recompensed by an equally copious deluge of goals at each end in a gritty battle that saw both sides pushing for a win. Lions scored the opener, Charlie Nevitt landing a clean strike to take the lead, but Rangers were unfazed and hit back an incredible six times in the first half having opened up and exposed a ragged defence and some below par work in midfield. A promising run from Chris McGee broke down as the Rangers rear guard drew into tight formation, but a turning point came ahead of the break as Will Juster completed a Sean Woodhouse cross. Lions drew together in the second half as the weather deteriorated and under a chilly downpour showed admirable determination to pull back to near level with Oakley. Defenders Aarin Johnson, Jake Draper, Dominic Ryan, Tom Horner and Mason Ashby sealed up the holes and a surge in midfield saw Adam Bradley and Ben Roberts sweep up a string of Oakley attacks. Will took a second goal early in the half and was followed up by Sean and MOM James Hurley, pulling Lions in range of the visitors who had looked to be running away with the game only 10 minutes before. Oakley scored again but the hosts responded in kind, Charlie completing a brace of goals to put the side one behind. Determined efforts from Alex Poynter and Aaron Gauntlett could not open up the precious chance at goal though, and Rangers were able to slip another past the fingertips of Dan Kennell, who had been truly tested throughout. Lions booked a place in the quarter finals of the league cup on Saturday with a razor thin victory over Division Two rivals Luton Borough. MOM Joe Rabey put Lions ahead in an opening half that saw a tenacious Borough side frustrated time and again by strategic link-ups and intelligent through-balls from midfielders Sam Bramston and Myles Frederick, resulting in a fine display of attacking football and a sequence of plays which looked likely to result in a goal rush. Lions' dominance prevailed into the second half as Sam Carter netted for a 2-0 lead. Cameron Burchill looked to have the goalmouth sealed up, deflecting a string of tidy shots and collecting some tricky volleys, while defenders Joe Thorne and James Glover shut down an enfilade of quickfire attacks. Borough turned the tables though, scoring twice to draw level and force the match into extra time. A searing shot from Joe Rabey in the final minute of extended play narrowly avoided a shoot-out, and Lions notched a well-deserved win in a scintillating encounter. The next Parish Council meeting to be held at the Coffee Tavern on Monday 7th December 2009 at 7.30pm. Lions ended their unbeaten run on Saturday falling to a 0-4 defeat against Crawley Green. The result ill-reflected the tenacious efforts of the boys and their long spells of possession during a match which they controlled for the most part. Dominating much of the opening half, the hosts were able to set up a panoply of goal shots, Joe Rabey brushing the crossbar more than once to maintain pressure on the visiting side. MOM Joe Thorne and fellow defender Sam Bramston picked up their share of loose balls at the back but Crawley were able to land a long-range strike and pulled ahead before the break. Cameron Burchill was well stretched as the second half got under way and despite the efforts of a mobile 011ie West and Sam Carter in midfield, Crawley were able to build on their lead. Toby McGee maintained a goal threat in the final 10 minutes but, despite a string of near misses, Lions were unable to get back into contention. Making a bright start, Lions earned a pair of corners and carved out a handful of strike opportunities, culminating in a Chris McGee lob that sliced the crossbar. Strong clearances from Aarin Johnson held off the Clapham attack until two goals fell in back to back. Pressing forward, the hosts drove in towards goal, Alex Poynter and James Hurley battling for possessing at the goalmouth. Searing runs from Will Juster and Charlie Nevitt compounded the pressure on a waning Clapham side and Lions looked set to overturn the scoreline. The visitors opened the second with a nice lob to go three up but smart keeping from Dan Kennel) and textbook defensive work from Mason Ashby, Dominic Ryan and MOM Jake Draper stemmed the flow allowing Lions to strike back on the counter. A looping Sean Woodhouse corner missed by a fraction and invigorating efforts from Aaron Gauntlett maintained the fight until the final whistle. When the seasons change - cold winds, damp days, frosts and mists herald the thoughts that winter is almost upon us. The witches, devils and other mischief-making beings have put away their broom sticks for another year; bonfires are now built - waiting for the starlit (hopefully) evening of fireworks and fun; the last? of the bar-b-q, foods planned - hot soup and jacket potatoes; hats, scarves and mittens, brought out to wear, - and the 'Guy' is ready to be burned. Change will either bless you or crush you, but which ever way it will be part of your life; accept it Solomon says there's a “time to every purpose under the heaven”. Ecc.3:1. Find God's purpose for the season you're in; rediscover your assets and use them. No two days are ever the same; they weren't meant to be. You will always be needed; it's just that the areas of need will change. As we get older we find that we are unable to do physically the things which even two or three years ago we did with little or no thought. Change creeps up on us. So often we allow powers to lie dormant, when with a little encouragement, they could flower and show newness of life. An example:- Take a few dead looking twigs from the forsythia bush (most of us have one growing in our gardens) place them into a vase with water in it, then watch. Soon you will see the little buds fill out and open into golden flowers, then in turn will come small green leaves. Leave them for a while and you will find that the twigs have grown roots! You can cultivate prayer that way - water it with faith, warm it with the love within you for others, then it will grow. Try it - it will make for change. There are not many things in this life that we can be certain of, but one of them is God's love - that is unconditional, it remains the same always. Solomon acknowledged the cycles in our lives; God controls the cycles in our lives. Whatever our situation is today, we can be thankful for God's seasons. Our Harvest week-end was a very special time. The concert by the Pasque Harmony Choir on the Saturday evening was excellent and enjoyed by a capacity audience. Our thanks go to all the Choir for their wonderful singing and to Graham Carter and John Mead for organising such a memorable evening. All proceeds from the evening have been given to the Keech Cottage Children's Hospice. The Harvest Festival next morning was a happy family service with a guest appearance by Gary the goat, who brought along a birthday cake to share with us. At the request of the preacher, Roger Owers , many of the congregation came along with something that was “special” to them. It was amazing the variety of items that folk had, pictures, pebbles, shells, flowers, bonsai and even a tortoise to name but a few. To complete our celebrations we all sat down to a very tasty Sunday Lunch following morning worship. Our special thanks to Pearl and all the people who helped with the catering etc and all our village friends that supported us. What a wonderful week-end! November Lunches will be served on Saturday 14th from 12 noon until 1-30pm and our charity to be supported will be the Iain Rennie Hospice at Home. Do join us and support this local charity. Our Christmas Lunches will be served on Saturday DECEMBER 5th in 2 sittings, the 1st at 12noon and the 2nd at 1.00pm. We offer a full Christmas lunch, Christmas pudding and coffee or tea for £7.50. Tickets will be available from the 1st of November from Graham Carter on 01525 220742 or at our November Lunches. The Charity to be supported at this event will be the East Anglian Air Ambulance. A warm welcome awaits. The Strictly Come super-Santa Apprentice Factor! Santa has spent the year scouring the country for possible super-Elves to organise and deliver his super-letters to good and deserving children! He has had auditions, boot camps and some group dances (Santa likes dancing!). Santa is a hard task master (even compared to Simon Cowell) and with the other judges - including Rudolf having a tantrum and Mrs Claus making it clear she isn't too old and won't be replaced - it was a trying time for the contestants, especially the task of delivering letters in the dead of night during a postal strike! But the good news is super-Santa finally delivered the verdict “You're hired not fired!” to the Four Villages very own super-Elves (who can deliver all over the country Royal Mail permitting!) Super-Santa will send to the good children a special super-letter reassuring the child that they are definitely on Santa's list, that he knows just where they will be on Christmas morning and that he knows just what they want for Christmas. Each letter is completely personal and is different for every child! Calling all relatives and friends why not send the perfect pre-Christmas gift which will bring a smile to any child's face. All you have to do to join in the fun is to email super-Santa on [email protected] - his super Elves will then send you a super-form to fill in the child's special Christmas details. Alternatively get a copy of the form from the super-Elves direct - they are again using 96a High Street, Eaton Bray as their base this Christmas (the house between the Village Shop and the Butchers). Then return the form to the super-Elves with £2.00 per child (or more if you want!) 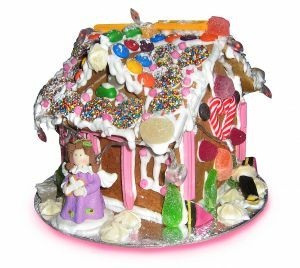 by Friday 18th December in an envelope marked with the code “Village Hall Project” (the super Elves have little Elves of their own so please be discreet!). Santa has agreed to donate all proceeds to the Eaton Bray Village Hall so roll up for a super-Santa super-Christmas!! Cheeky Monkeys under fives playtime will be holding their Christmas party on 16th December, at 1pm, in Eaton Bray Village Hall. There will be fun, games and music with local entertainer Jacqui, from "Jacq in the Box." For further details and lots more information about our group, please visit www.cheekymonkeys.btik.com. We look forward to seeing you there! Philip is an average salesman, going through a messy divorce. Deciding to inject some much needed excitement and cash into his life, he devises a sure-fire get rich scheme. Realising he can't succeed alone, he enlists the help of two rather naïve business colleagues, John and Dave. With gentle persuasion from Philip, both are enticed into his get-rich-quick plan. However, when Dave and John start behaving uncharacteristically, their wives Gemma and Gillian become entangled in the plot, and things don't go quite as planned. With reference to the story in Focus Magazine with regard to the discovery of Cyril Jackson's grave, let me say - it was never lost! I was first made aware of it nearly fifty years ago by village people when gathering facts on the village history. Moving on to 1987, the Dunstable Gazette ran a story from a man in Leeds searching for information for his family tree. I contacted him and over the next few years we pieced together his family's Eaton Bray connections together with photographs. Unfortunately Roger died in 2004. To cut a very long story short, I'll start in 1854 when Joseph Henley married Kitty Abrahams. Joseph was a farmer's son and Kitty's parents were tenants of (Richard Fountains) Fountain Pub in the High Street, now May Close. The product of their marriage was 8 children, William, Elizabeth, Anne, John, (he died very young) Mary, John, Louisa and Arthur. For the purpose of this exercise it's Mary we are interested in for it was she who married Jeffery Jackson on 14th April 1884, they also had 8 children, Elizabeth, Cecil, Arthur, twins Ethel and Hettie, Gertrude and twin boys Alec and Eric. Back to Mary's brothers and sisters! William married Mary Trippit and very shortly moved to York as an agriculture labourer. Elizabeth married Edmund Wildman and went to live in Harrow. Anne married William Rollings and was a tenant at the Hope and Anchor, Bower Lane. John, as mentioned before, died young. Another John born 6 years later married Hettie Roberts of The Rye. They lived at Moat Hall before they joined brother William in York. Louisa had 8 children. Arthur married Isobella Tolloch, an Australian, he went to London and became a policeman. On the 15th October 1905 Arthur came to his mother Kitty's funeral at Eaton Bray, he caught the flu and never recovered. He passed away on 13th January 1906 and is burned near his mum. I should also mention that John and Hettie had 13 children in York. Hettie had a small dowry which they invested in a coal merchants business at Layerthorpe, the York terminus of the Derwent Valley Railway. He sold out and bought a farm at Skipforth, Stillingfleet Hill. Mary and Jeffrey started married life living in The Rye. The house they lived in was Mr. Roberts Maltings, a house he bought in 1843 from Dunstable Brewery Co.
Their 8 children were born here. Elizabeth married Ernest Wildman (you will remember her aunt was also married to a Wildman). Cecil went down on the Titanic on 24 April 1912 aged 21 years. Arthur, 1st Battalion Bedfordshire Regiment killed in action 23rd April 1917 at Flanders. He is commemorated on the Arras Memorial, Calais. Elizabeth moved to Oakley, north of Bedford and at some time worked as a nanny, travelling around the world with the family, and, at one time visited the Argentine, quite rare in those days. It was to Oakley and Elizabeth that Jeffrey finally retired to after his beloved wife Mary died in 1945. Ethel went to Bedford and worked as a dressmaker. She later became a companion to Lady Rhoda Birley, wife of Sir Oswald Birley, the Royal Portrait Painter, returning to High Street, Eaton Bray on her retirement. I visited her in 1987. Hettie, her twin sister, married and became Mrs. Bowley and lived in Leicester. She had two children, Arthur and Margaret. Gertrude married Gordon Sear who was the son of Will Sear, manager of the Coffee Tavern. They lived in Luton Road, Dunstable. Mr. Sear was an insurance man. They had two children, Patricia was born in 1932 and married a Vicar and Judith, born in 1938 became a Senior Nurse. Gertrude was keen to keep the family name going so named her daughters - Henley Sears. Alec married Grace Bleeny and had Pamela in 1937. His wife died and he remarried and in 1942 he had Elizabeth Ann. Alec worked for Wallace Nursery as Foreman of the water tower. He left there in 1948 and moved to Shefford. It was here he helped his wife's relatives to set up a green house business. Eric, Alec's twin, qualified as an electrician and married and went to live in Stewartby near Bedford. He was foreman electrician for the London Brick Company until his retirement. He had two children, Beverley and Roger, Beverley died young in a road accident. In the 1920's Mary and Jeffrey moved to 38 High Street and it was here that “Jul", as he was known, ran a greengrocers business from the yard at the rear. He would fill his pony and cart with produce and hawk it round the villages. Together with a bit of light carting, he would eke out a living. He is remembered by Maurice Sanders as being a hard working Methodist devoted to the Chapel. Maurice also mentions him in his book “Memories of Methodism” quote - “As a radical who thrilled to the tune Lloyd, and with a lusty voice, he would start up the last verse of the favourite hymn time after time until the organist could get in the Amen”. My thanks to the following people for their help. Roger and Ann Davies, Margaret Knight, Maurice Sanders and Mrs. Pamela Roberts. Without their help this tales would have been impossible. It is hard to believe that our Pre School has now been open for a year. I think it is really beginning to feel like home now for the staff and the children. In fact one of our parents said 'it is the closest to home a School can be'. The outside area is being developed, the new furniture is in daily use, the Children's Centre have been running Jo Jingles, Bumps and Babes and Story and Rhyme Time. All is well with the world; it is obviously time for our next project! As we hope everyone knows by now, E. B. Lions AFC is a children's football club for the boys and girls living in and around the villages of Edlesborough, Eaton Bray, Dagnall and Northall. Formed in 1994, the Club has grown enormously in the last 7 years and now has 16 teams this season 2009-10, with 200 children, predominantly living in the village, playing competitive and active team sport. We have boys and girls teams ranging from Under 5's up to U15's and have almost 40 brilliant coaches, most of whom are FA qualified and CRB checked and all devoted to creating fun, improving fitness, technique, team spirit and above all else confidence and memories. There is a real and strong demand for village based football now, where the skill levels, coaching and development of players and teams is one of the best in the County. This also allows the boys and girls to play with their classmates and friends. Whilst we have been hugely successful in stimulating demand and our teams are all of a good size and standard, we do have a small number of opportunities still available in certain age groups/teams and these are detailed in our advert in this months Focus. There are 1 or 2 places available at Boys year 4, 5 and 6 so please get in touch if you are keen. Finally there is just 1 or maximum 2 additional places in both the boys and separately girls U14's (year 9) teams and we would love to hear from you too! Our player registration fee is amongst the lowest in the area, made possible by not having the cost and liability of our own ground and is great value as it includes all subs and playing kit too. More importantly, the huge support of our team sponsors, who make such a huge contribution, helps keep fees low. Please see our website for our current sponsors details and we thank them again for helping us so much. We are delighted to announce that EB Lions AFC, after much focused work by our committee along with our dedicated coaches, has secured the coveted Charter Standard Community status from the FA this September. There are only 6 Charter Standard Development Youth Football Clubs in Bedfordshire who hold this highest level CS status. This scheme is a core component of the FA Football Development programme. The scheme established minimum standards for football development and acts as a quality assurance mechanism recognising well run schools and clubs. As a benchmark for quality it will improve the playing experience for all. Community Clubs, the pinnacle of the club development pathway, will be those that have a high quality, multi-team (minimum of 10 teams) set up with excellent social, training and playing opportunities for all. As such, the number of Community Clubs is one of the truest measures of success for The FA Football Development strategy. Youth Football Clubs are the heartbeat of football in this country. That is why The FA Charter Standard club programme, which raises standards and recognises and rewards quality, is so important and is a big priority for the FA nationally. It demands strong governance (CRB, codes of conduct etc) and beliefs, including the FA's Respect campaign which we fully endorse. We enjoy huge and very appreciative support from the Parish Councils in Eaton Bray and Edlesborough, plus the Dagnall Village Council, who allow us to play all our matches in the centre of our community and on pitches and village Greens, where anyone can come along and watch. Eaton Bray Parish Council have very kindly just confirmed agreement for us to use the Rye (previously Eaton Bray FC) pitch for our younger 11 a side teams and this is gratefully appreciated in supporting our growth and provision of local, quality sport. The three local Primary schools are hugely supportive of the Club and we enjoy the use of Edlesborough Schools facilities for training and development (many thanks to the new head, Jane Foster). Moreover all 3 schools actively promote us within school and we have recently seen a surge in the number of children from Eaton Bray joining the Club, which is fantastic news. We have had significant support from the Football Foundation, who have provided substantial funding over a 3 year period to allow us to develop new teams and enhance coach development, with a substantial number of our coaches undertaking their FA Level 1 and increasingly Level 2 FA coaching badge. Last month (October 2009) we are proud to advise that we have 6 coaches starting their six month Level 2 badge, all funded by the Club through FF support. We also have a project well advanced, which will substantially increase the equipment we provide for our teams and players and with the added involvement of a number of young potential coaches. The FA is concerned about the high drop out rates of teenagers at 16-18 age group from football and we have a number of players whose teams have finished, but who would like to stay in football. With the help of the following grant and funding partners we are looking to offer them intensive coaching and training and to become role models to the younger players/teams. Bucks Playing Field Association - The AVDC PAYP scheme to support 13-19 year olds. ......and of course the fruits of our own fund raising. There is the further possibility of additional grant funding which will increase the project and equipment purchased even further. Our fitness coach, Nick Bramston, who has gained his first module of the FA Level 3 coaching badge is working with many of our teams to improve fitness and agility at all levels. We have appointed Richard Potton to the Committee and specifically to be our Girls Football Development Officer. We have 4 girls teams already and are at the forefront of this fast growing and exciting area of football. Rob Gadsden won the first Janet Hatfield annual trophy for his contribution to the Club. Rob is only 18 and is our first young sports person to develop his coaching skills. He is starting his Level 2 as we speak and has done wonders with our U13 boys team, alongside Adrian and Ian. He is a wonderful advert for the youngsters living in our villages. Rob also won a County FA Development Workforce Award for Young Volunteer of the Year. Adrian Bush also won a County FA Development Workforce Award which recognises the huge contribution of volunteers within the game. We work alongside the Eaton Bray and Edlesborough Scouts as well and you will know from last month's Focus how well they are doing, with demand for places at an unprecedented level and with dynamic, keen and committed leaders. We are both providing high quality, structured and organised fun and learning for the children in the villages and are leading the way in the Counties in our chosen subjects. The children are fortunate to enjoy such wonderful opportunities and in turn do us all proud with their commitment, effort and behaviour which doesn't always get as much noise as it should. So we have, in case you didn't know !! The cubs and Scouts had a fantastic time at their summer camp held in Sherwood Forest with activities including Archery (naturally), Quad Biking, Climbing, Abseiling and Kayaking. The highlight of the camp was the Medieval Joust and pig roast, which ended up more like 'It's a knockout' with Paul, Simon and Nick dressing up as camp Robin Hood, Friar Tuck and the Evil Sheriff of Nottingham (as mentioned in last months issue). With the new term well under way Beavers have had fun on the Green putting up tents and having an evening picnic and sing along. The Beavers have earned the first stage of their Emergency Aid Badge, whilst also enjoying themselves, acting out emergency situations and applying copious amounts of bandages. We have also enjoyed a night of campfire songs. This term we have invested six new Beavers into the colony and are delighted to welcome two more girls to our number. The Scouts have been gliding and both Cubs & Scouts have been on bike hikes and night hikes. The Scouts have also completed their fire safety badge by visiting the new Dunstable fire station. A superb talk by Ram and the team kept them all enthralled, entertained and taught the guys all about fire safety, the workings of the brigade and the equipment used by fire-fighters. The Scouts are off on the District Hat Challenge, which is the start of this years District Scout competition; keen to defend the title they won last year. The Cubs also ran out winners of the Cub District Cross Country, winning two of the three classes. Well done to Sam Carter, Adam Hurley and Charlie Giblin. The cubs have been out bat hunting with bat detectors and have done a spot of open fire cooking. 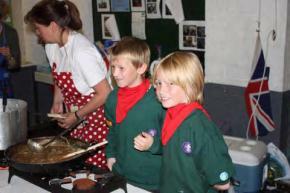 A highlight for the cubs was our Allotment Bistro night. With the hut transformed into a cheap Hells Kitchen the cubs used accumulated produce from the Cub allotment (sown, nurtured and planted by cubs), to prepare and cook a three-course meal for their parents. 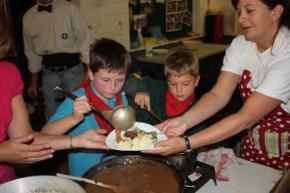 Also acting as waiters, the Cubs served up Courgette and Stilton or Tomato Soup. Bangers and mash in Onion gravy with runner beans and carrots with a desert of rhubarb or apple and blackberry crumble and custard. We were expecting maybe a dozen parents but the cubs coped superbly well, serving a total of 44 covers complete with drinks during and tea/coffee afterwards - and not a drop spilt or crockery dropped! Thanks to the parents for their support in turning out and to Lorna, Keith, Jonny & Anne who assisted the cubs with their cooking. Many thanks must also go to our allotment neighbours for their encouragement, advice, recipes and patience during the year. For more information about all sections contact the Group Scout Leader. Lions extended their unbeaten run with a hard-fought away win over Sundon Park to go a point clear at the top of the table. Shots from Sam Carter, Joe Rabey and Toby McGee might have expanded the margin of victory but only MOM Sam Bramston was able to complete, firing in from the edge of the area for a first-half lead. Even so there was eye-catching football in the second as Lions unloaded a series of offensive plays, including a fine lob from Joe Thorne. Accomplished defending by James Glover, tireless support from 011ie West in midfield and another clean sheet from Cameron Burchill amounted to another strong display and a statement of intent for the 2009/2010 season. Lions made it two wins in a row with an away victory over Langford on Sunday. Having conceded a goal inside the first 20 minutes, James Hurley drew level with a neat finish to keep the visitors in the match. Intelligent defending from Tom Horner, Ben Roberts, Jake Draper and Aarin Johnson ruled out the majority of Langford's goal assaults, while MOM keeper Dan Kennel) put paid to a string of difficult shots that broke through Lions' back line. Increasing the pressure after the break, Lions opened up a series of scoring opportunities, Sean Woodhouse, Will Juster and Charlie Nevitt setting up enterprising runs into the Langford half. A well-earned goal from Dominic Ryan and a clinical finish by debut scorer Chris McGee opened up a comfortable margin, which James extended further, netting his second of the match. The hosts remained defiant though and, after missing a penalty, drew one- back with 10 minutes remaining. Even so, energetic runs from Mason Ashby, Alex Poynter and Adam Bradley maintained further goal threats, and a long range Aaron Gauntlett lob fell inches wide of Langford's upright. You would have thought that with the onset of the darker evenings, the colder afternoons and the ever-increasing risk of aquatic chaos, winter blizzards, snowdrifts and subsequent general mayhem, our on-court tennis activities would have begun to slow down, in preparation for that much anticipated hibernation period. That period where the tennis racquets are lobbed into the attic to gather cobwebs until the first rays of spring sunshine peep through the curtains, usually around April, to entice us less devoted players back out onto the courts so that we can play wearing less than six layers of clothing. But no! This year things are different; and as I pen this, one dreary Sunday morning in mid October, there are no less than 24 members due on court to take part in the first leg of our new Winter League Ladder. The brainchild of committee member Glenn Wigley (although we all think he used his computer), the competition runs over a six-month period playing once a month, with players competing against one another in groups, to move up the 'ladder'. At the end of March there will be a declared winner who will be the proud recipient of the 'Mike Venn Trophy', named in remembrance of Mike, late husband and doubles partner of club founder member Judy Venn - still a regular player and a mixed doubles finalist this year! As 'Focus' goes to press tomorrow, I can just squeeze in a report on last night's Quiz at the village hall, jointly organised by the village hall and tennis club committees. No less than 172 people battled in teams with names such as the 'Eggheads' and 'Braindrain' to answer questions on everything from atomic atmospheric elements to football players. At this point I wish it to be known that I said 'Argon' but no-body believed me. And no, that's not the footballer. I wasn't the only one - no-one believed Jane Wigley's 'Tufted Puffin' either, but somehow our team still came second to the 'Magnificent Seven' who took home a magnificent seven bottles of quality wine (or so the notice said in Aldi). 'Mary's Ladies', now re-named and down to seven following the sad passing of Mary French, took their usual 'consolation' prize of seven boxes of fine chocolate; I'm convinced those ladies are actually mega-intelligent with IQs to match that of Stephen Hawking, but use that intellect to purposely come up with all the wrong answers and come last, to purposely win the chocolates every time. Seems to work though, but beware ladies, I've seen through your crafty plan and next time my team plans to answer the question before last, just like the Two Ronnies did in 'Mastermind'. That way we'll have all the right answers, but not necessarily in the right order, and get to take home the chocolates. I'll keep that quiet until the next quiz though. The change of usual compere to yours truly, was forced upon the unsuspecting audience by Ross Bagni's long planned holiday to Scotland with equally long suffering wife Shelagh. The holiday itself was briefer than planned, as whilst unloading their car, poor Shelagh took a tumble and managed to break her femur which has resulted in a fairly long enforced hospital stay there. Our thoughts are with Shelagh for as speedy a rehabilitation as possible; Ross has promised to encase her in bubble-wrap for her next outing. That said, we still managed to make a total profit of £1,300 to be split between the village hall and the tennis club; £431 of which was from the superbly supported raffle alone. Huge thanks go to Katrina Hurley and her team of helpers, Keith Blackburn our quizmaster extraordinaire, ably assisted/hindered by Glenn Wigley, EBLTC Chairman Bernadette Hillman, and everyone involved for making this such a successful evening. Put the next one in your diaries now - Saturday 24th April 2010 and book early! You are viewing the November 2009 archive.